There has certainly been a rise in the number of vegan brands in prestige beauty and this coincides with consumers adopting a more conscientious approach when purchasing products, looking closely at the underlying philosophies and actions of the brands. What does ‘vegan beauty’ mean? The nature-loving brand that promises never to test on animals, Paul Mitchell has a range for everyone, including men. Our pick is the vegan Tea Tree range . Suitable for all hair types,it smells fantastic and gives your scalp a unique tingle for a refreshing, cleansing feel. 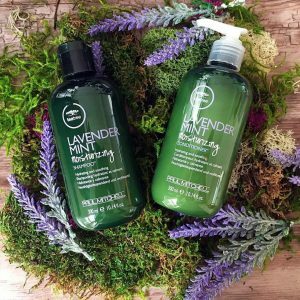 100% Vegan, Pureology is also zero-sulfate. A salon-led brand, this is serious colour care. We recommend Strength Cure, a treatment range that fortifies damaged, coloured hair, and strengthens with a soft, velvety finish. 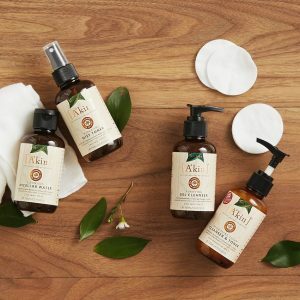 Many brands nowadays are turning to organic, natural ingredients, but for a 100% fully vegan choice A’Kin is our go-to. This Australian brand is not only vegan but features organic ingredients, contains no nasties and is cruelty-free. We absolutely adore their Rosehip Oil, which works wonders on scars, dry and ageing skin. If pigmentation is a problem, choose their Rosehip Oil with added Vitamin C. But it doesn’t stop there, because A’Kin has a whole range of skincare from micellar water to day cream, cleansers and body care. Mineral makeup is so well known, it’s hard to remember the days when it was considered weird and unusual! But back in the early 2000s it certainly was a new thing, and pioneering the way was Jane Iredale. Her mineral makeup was first loved by cosmetic surgery clients who needed something very kind but very effective while they healed from their treatments. It wasn’t long before everyone noticed how fabulous mineral makeup looks on the skin – the natural, dewy effect just can’t be missed. It was also amazing for anyone suffering with acne, as the acne virus just can’t thrive in the mineral pigments. 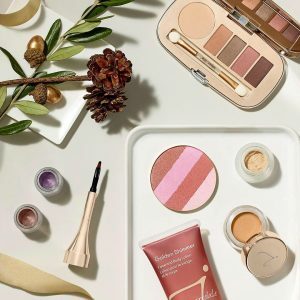 Jane Iredale products are certified cruelty-free but some do contain carmine and beeswax that dedicated vegans will want to avoid (see details here). 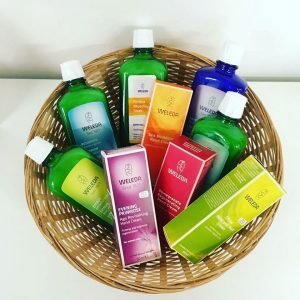 100% natural and completely at one with nature, UK company Weleda has a whole range of products from bath and body to skincare. Around 3/4 of their products come from organic or biodynamic farming and Weleda believes strongly in fair treatment of everyone from suppliers to partners and customers. While not all products are vegan (some contain lanolin, beeswax or goat milk – check here for more info), most are and as a company with a strong ethical stance, they’re defintely on our ♥ list. Try their vegan Lavender Bath Soak as a real treat! 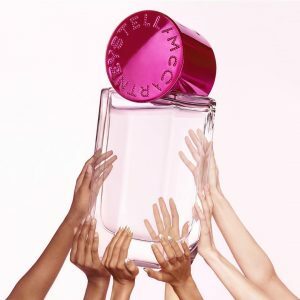 A completely vegatarian company, all of Stella McCartney’s fragrances (produced by COTY) are vegan friendly. With no ingredient tested on animals or made from animal origin, including bees, Stella McCartney has deliberately removed all of her fragrances from China where animal testing is required by Government regulation. We can’t get enough of Pop, with top notes of tomato and violet leaves, green mandarin and base notes of violet, tuberose and cedarwood. Find out more about Stella McCartney’s ethical and sustainable policies here. The first and only Eco Certified organic tanning product in the world, Tan Organic is the natural way to get a New Year glow. 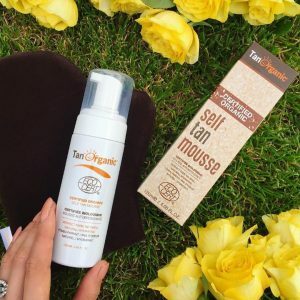 Only using natural and organically grown ingredients, from ethically run producers, this fabulous brand truly cares about people, animals and the environment. Certified by PETA and free from animal testing, their products also contain no nasties such as parabens.